The DefenderPad® laptop radiation and heat shield is a unique and pioneering solution that provides ultimate safety while using today's modern mobile technology. Incredibly sleek and functional by design, it offers a comfortable and convenient workspace. More importantly, the FCC certified lab tested. 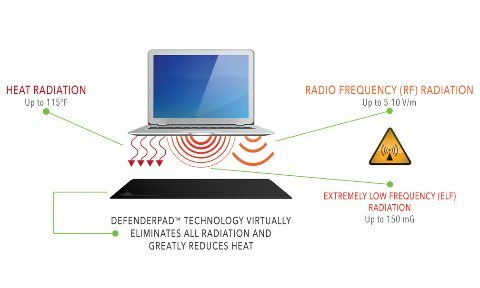 DefenderPad® blocks virtually 100% of potentially harmful Electromagnetic Radiation (EMR) and greatly reduces heat emitted from the bottom of laptops, tablets and other electronic devices. So drop those lap desks, lap trays and cooling pads. You can feel secure knowing you are protected anywhere, anytime with the all-in-one DefenderPad® laptop radiation shield. DefenderShield Tablet Computer Radiation Protection from DefenderShield on Vimeo. DefenderPad Laptop Radiation & Heat Shield by DefenderShield from DefenderShield on Vimeo.